Poussin Gallery’s summer show features artists who exploit geometry’s basic elements, its points, lines and angles. These elements support an eclectic range of approaches to abstraction, with the orchestration of colour - sometimes hard and direct, elsewhere softer, more lyrical - of primary importance. The show mixes younger and more established artists and work in media from patchwork quilts to welded steel sculpture. A selection of new work by Gillian Wise – member of the British Constructivists in the Fifties and the Systems group in the Sixties – continues her long-standing interest in grids and in mathematically derived pattern and proportion. Away from Wise’s objectivity, Tom Chamberlain’s drawings hover between the organic and the mechanical, their shimmering lattices stemming from painstaking and repetitive process. In ordering almost pastoral colour, the grids and lozenges of Emma Biggs and Matthew Collings achieve a similar light-infused delicacy, one shot through with snatches of warm reds and oranges. 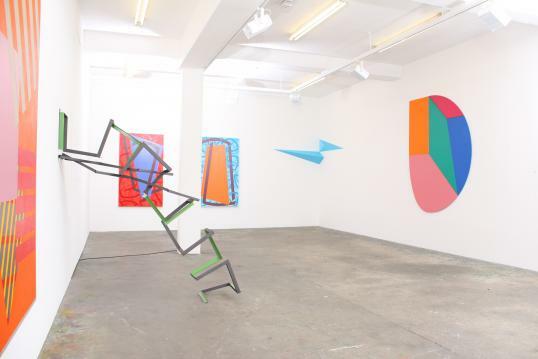 The show’s two sculptors make use of the already existing planes and angles of the gallery. Sheila Vollmer’s repeated steel units spring their grids from wall to floor, or rise monolithic from it. George Meyrick, who will be creating a work especially for the gallery, pitches folds or pyramids of colour in the spaces between walls and corners. Two artists work with fabric. Alasdair Duncan in banners of Poppy, machine-produced and hard-edged abstract forms, whilst Sarah Greenwood’s quilts introduce fragments of representation not normally associated with geometric abstraction. Established abstractionist Colette Morey de Morand’s recent painting combines the push of often fierce colour with space opening illusion and elements of Op. Following her 2006 retrospective at Poussin, Vanessa Jackson’s paintings also have something of a disruptive aspect, in their complex decorative schemes and perception-jolting manipulation of traditional space-creating devices. The shaped canvases of Nigel O’Neill too manipulate space, though their interlocking segments of clear direct colour do so with a more measured calm.